The Huawei P30 Pro is expected to launch alongside the Huawei P30 tomorrow, but that doesn't mean there isn't time for one last leak. A video posted on Chinese social media platform Weibo by user Llwenhui shows the front and back of the phone – it's a short video, but it's also very revealing. What do we know about the iPhone 11? On the front of the phone, we can see the screen. It's not turned on, so we don’t get an idea of its quality, but a previous leak has suggested it’s a 6.47-inch 1080 x 2340 OLED screen, which would make it bigger than the Huawei P20 Pro. We can also see the front-facing camera, but because the screen isn’t on we can’t see if this is part of a ‘teardrop’ or wider notch. The rear of the device shows us the rumored four-camera setup, which here consists of three main lenses and a smaller side lens, joined by a flash, although we’ve not heard any hints as to what this new lens adds. Perhaps the most intriguing thing we see in the leaked video is the rear design of the Huawei P30 Pro, which has a cyan and violet gradient pattern. It looks a lot like the P20 and P20 Pro's 'Twilight' design, which changed color depending on what angle you looked at it from, except with lighter and more vibrant colors. This gradient effect design was a hit with the P20 range of phones, so it’s possible Huawei will try to add some new variations to its lineup with the P30s. We also briefly see the bottom of the handset, and it looks like it has a USB-C connection with no headphone port, which is what we’d already heard from leaks – but we don’t exactly get a leisurely look at this part of the phone. 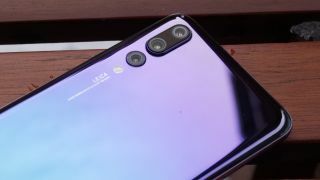 Huawei is set to launch the P30 and P30 Pro tomorrow in Paris, so check back to find out all about the new phones as well as how they stack against each other and their competitor flagships.